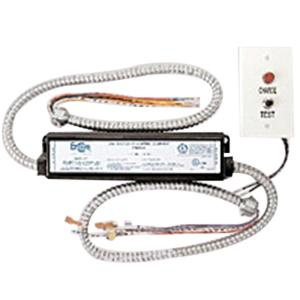 Encore Lighting EP Series Emergency fluorescent ballast is suitable for use with one 20 - 40-Watt T8/T12 lamps. It has voltage rating of 120 - 277-Volts. This fixture mountable ballast features 18-gauge die formed steel housing. It operates at the frequency rating of 60-Hz. It measures 9.5-Inch x 1.5-Inch x 2.375-Inch. It features test switch and visual AC/charge indicator. This ballast offers 500-Lumens of maximum initial light output. It runs on Ni-Cad battery. Ballast is UL listed and meets NEC/OSHA standards.